The measurements provided are what I used for my quilt, but the technique would be the same if you decided to change the size of your strips, or the final size of your blocks. 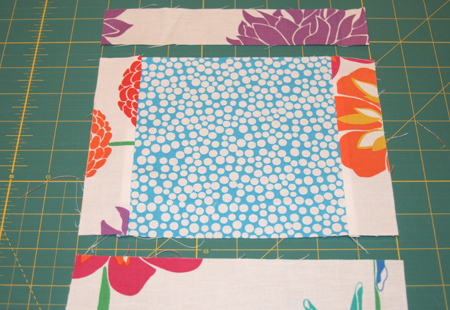 Using this method you’ll construct large blocks which you’ll then cut into quarters. These measurements produce a block that is 16″ square (or 15.5″ square, if you’re like me and aren’t as precise!) 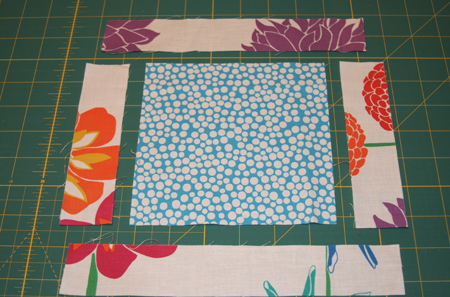 which is then cut into four blocks that are 8″ square (or 7.75″ in my case!) Please note that 1/4″ seam allowances are used. All that being said, let’s get started! First off, select a bunch of fabrics you’d like to use. I probably used around 10-15 prints and about 5 solids for my version, but this is totally up to you! 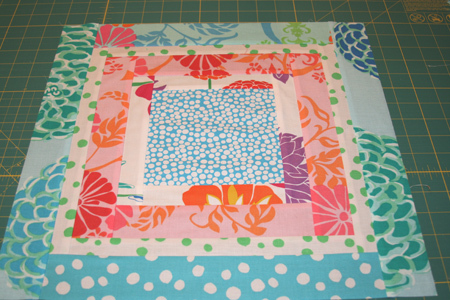 Select a fabric for the center of your block and cut this to 6″ square. 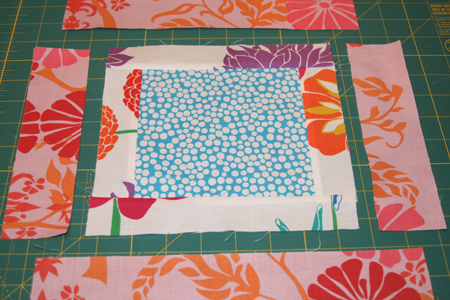 Then select the fabric for the second ring of the square. This fabric will be cut to 1 1/2″ wide. You need 2 pieces 1.5″ x 6″ and 2 pieces 1.5″ x 8″. 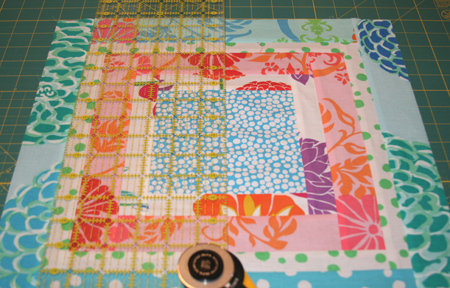 Sew the shorter strips to the opposite sides of the square. Press. (I press mine to one side, but you could certainly press your seams open if you’d rather). Repeat this process for the second set of opposing strips. Press again. The next ring is 2″ wide, and for this ring you’ll need 2 strips that are 2″ x 8″ and 2 strips that are 2″ x 11″. Repeat the process to sew the shorter strips to opposing sides, and press. Repeat with the next set of opposing strips. The third ring is 1.25″ wide, and for this ring you’ll need 2 strips that are 1.25″ x 11″ and 2 that are 1.25″ x 12.5″. Repeat steps from above. The last ring is 2.25″ wide. For this one you’ll need 2 strips 2.25″ x 12.5″ and 2 that are 2.25 x 16″. In theory, this should result in a block that is 16″ square. (this assumes that you have perfect 1/4″ seams and that your ironing skills are spot on!). In reality, my blocks always ended up just shy of 16″ square, so instead of worrying about it, I opted to trim them down to 15.5″ square. I just eyeballed it and trimmed a bit from each side, but in order to make sure everything lines up correctly, you’ll should mark the center of the block and measure out 7.75″ from the center on each side and use this as a trim line. 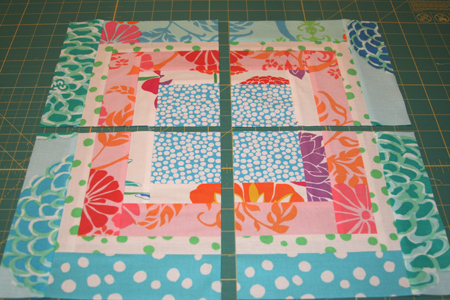 Once your block is square, you can simply cut it into four equal pieces. In my example, with a 15.5″ block, I measured in 7.75″ and cut the block in half and then repeated for the other side. Repeat the process for constructing these blocks, changing up your fabrics and the placements of those fabrics and then rearrange the quarter squares into full blocks. 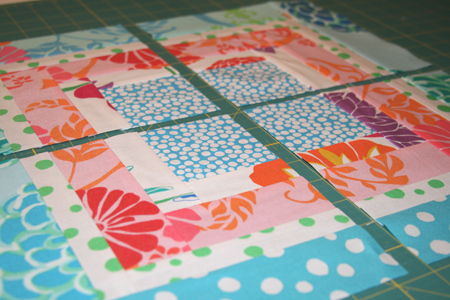 Sew your blocks back together, and then sew all the large blocks together into a quilt top! For the quilt I made, I made a total of 12 full blocks, which resulted in a smallish quilt, measuring about 40″ x 54″ after washing. Enjoy! And as always, feel free to comment with any questions or if you spot any errors! Oh, and an aside – I made this block for the tutorial, but don’t have any plans for it… if anyone’s interested in these 4 quarter blocks, leave a comment. If more than one person is interested, I’ll let random.org pick someone tomorrow! Edited to add: The winner has been selected – Congrats to Jessica Brown! This entry was posted in Quilt Blocks, Tutorials and tagged bento box, handmade, modified bento box, quilt, quilt block, quilting, tutorial. Bookmark the permalink. It’s finished! A modified bento box quilt. Thanks for the great tutorial! You make it sound so easy! Are you really giving away that block? Would love to have it! Happy Wednesday! Thanks for the tutorial! 🙂 I love this look! 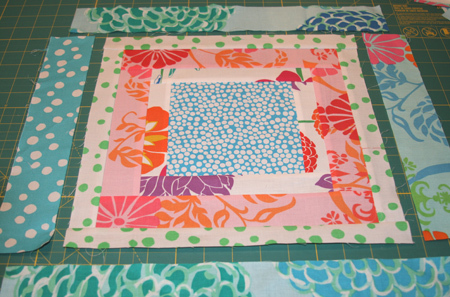 I would love to have that block:) I am new to quilting and am excited about the possiblities for fabric use. Thanks for the tutorial. Love this block and the tutorial. I would also love to win the block but I really don’t think I would be able to find the fabric to do it justice in a quilt so feel free to leave my name out for the block, but I really do love the block and the fabrics. So funny that you offered the block, because the only problem with your tutorial for me was that I was so distracted by the pretty fabrics and watching the look change as you added new rings! It would certainly be a fun challenge to make a quilt around that one block! Can’t wait to try your modified bento box! Brilliant! i’ve been pondering making the regular bento box pattern, but i had never thought of cutting one block into four. it sounds like it would save so much time! thanks for the idea! Thanks for the tutorial. I’d be interested in the blocks. Many thanks for the tutorial. Of course I would be interested in the block. It would be the first one in MY modified bento box since you so kindly showed us how to construct it. I love, love, love your blog. It is one of my regular reads. 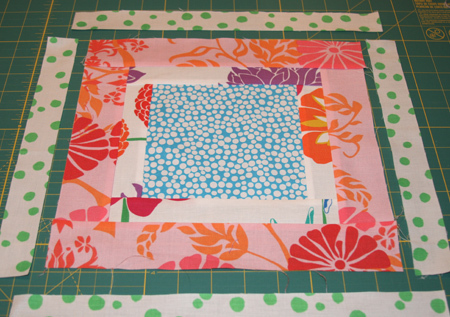 you are so talented when it comes to putting fabrics together and this block is no exception. muchas grcias por el tutorial!!! thanks for sharing, i love this block! Your quilting first caught my eye a couple of months ago and continues to inspire me! I have made 3 quilt tops using your posts as a guide 🙂 The scraps are piling up as I am on my 12th square for a string quilt using your tutorial as a guide. My next step is to try quilting the tops I have made. I love would to be randomly chosen for the sample block! Very similar to the bento-box quilt pattern I just published. I also don’t know what the actual pattern is and just made one up. Thanks for the tutorial. I’d love the block, if no one else wants it! Great tutorial! I’d love the block, too! Thanks Ashley!!! You made it very easy to understand! I am just smitten with all of your quilts. Every time you make one I add it to my list of projects and star your post in Reader to reference back to it. Your directions and photos are always so clear, so thanks for the inspiration! so cute and so easy!!! thanks for sharing! I love your work. Thanks you for the tutorial on the Bento Box I would love to win your sample piece and may try making myself a sample this afternoon too. Are you kidding? “If anyone is interested,” haha, of course! I’d love the blocks, they are sooo lovely. Thanks for the tutorial! Nice! You make it look so nice and simple. Gorgeous! I’m totally adding this tutorial to my to-do wish list. Easy to do, gorgeous finished product. So many color possibilities! Thanks for sharing! I would LOVE that block to help to visually tutor me through the process. Wow, I love how you did your modified Bento Box. Thanks for sharing! I can see you sample with white sashing and turned into a pillow. Count me in! thanks for that GREAT tutorial!! i’m going to have to try it that way. it’s the dissappering 9 patch theroy also. a few quilts in one. LOVE it!!! thanks again. I love it! Thanks for the tutorial too. I’m cutting my pieces for my first quilt and it just happens to be a Bento Box. I would also love to make this modified version. Thanks for the chance to win your square. I’ve got two projects going right now but may have to pause to make this. Your tutorial makes great sense. And I’d love those blocks too! Wow! I’d love to win the block; thanks for offering it up. 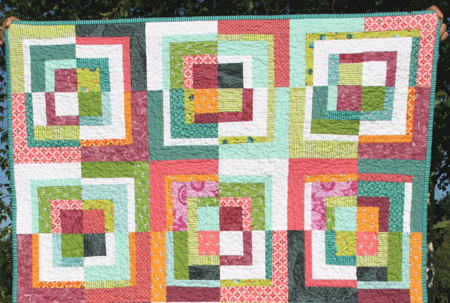 I think I’d try using it for a pillow…love the quilt and your blog! ARE YOU KIDDING?!? THE BLOCK IS GORGOEUS! oF COURSE i WANT IT! tHANKS FOR THE TUTORIAL! The fabrics you used are gorgeous – and of course you will need to use random.org – everyone is going to want it, including moi!!! Thank you for your veRRy nice Bento Box tutorial!!! hey. that block looks great, would love to get that in the mail!! simple, clear tutorial..nice work. love your blog and your tutorials so that I recommended it to my friends – and they also love it! Thanks for the tutorial! I’m collecting ideas for my next project, so into the possibilities this one goes! Another tutorial!!! I’m just soooo happy. Thanks!! Thanks for the very helpful tutorial. How generous that you are giving away your block! I would love to have that be the start of a quilt! Just discovered your blog this week. Love this quilt! Thanks for the tutorial! Oh yes, I would love that square you made! I am recently hooked on your website and find so much inspiration in your work. Besides your high-spirited and unexpected fabric choices, I really love your creative approach to your quilt backings. Very cool. Oh yeah, and a chance to win your bento blocks woud be great. Thanks! I love this quilt. Thanks for the tutorial! And yes, love the square too. Count me in on the random draw. I’m so excited to make my own bento box quilt, thanks for the tutorial, so much nicer than squinting at the computer screen and trying to figure out what the heck to do! Thanks for the tutorial! I love the quilt. Way cool. Love the block.and thanks for the tut! I would love to win. It would be a great start toward building my version. I think it is absolutely GREAT that you gave specific instructions on what to do!! I need a tutorial just like this! And, who would not want your beautiful block? Please enter my name. i LOVE your style, girlfriend! i just started quilting because i’m a little obsessed (ok, a lot obsessed!!) with all the beautiful, modern fabrics that are available now. and i just had to let you know that you are my main inspiration! great tutorials, i’m putting in a request for a binding tutorial….thanks for sharing your amazing work!!! I love this tutorial but I’d love to have those blocks more! I just finished one quilt top and I have been thinking to make a bento box quilt. Your tutorial just come in time. Great tutorial. Hi this would work faster for a regular bento box quilt, I like this one better, thanks for the tutorial!!!! I’ve had the bento box pattern for a long time and it seemed like a lot of work… but this makes so much more sense to me and looks FUN! Thanks for the tutorial! Please count me in, I would be honored to win your tutorial block; you and your blog are always so inspiring! Thanks for this great bento box tutorial! I’ve always admired these but have never made one. This will help immensely….of course, after I finish some UFOs. Love the fabrics you used! i tried it on my first quilt, and it went off with out a hitch! ashley, how much of each fabric would you estimate needing? a fat quarter? i am so excited about your tutorial…i can not wait to try it out. i am going to have to go through my stash and see if i have enough for this. LOL – you had doubts that there’d be more than one person interest in your block?! Thanks for the tutorial! And now I wonder how the “brand name” pattern goes. I imagined yours done just as you’ve outlined. Thanks again, and yes, I’d love a chance to win your block! Hey, one less to make of my own, right?! oh dear–this is not good. while checking up on my blogs tonight–your tutorial is the second quilt that i want to make RIGHT NOW–regardless of the fact that i’m in the middle of two quilts and have 2 more planned out. oh well. thanks for your tutorial–i’ll see how long i can resist! Great tutorial. I have the Bento Box pattern but I’m liking yours more. Great tutorial I have been thinking about making that pattern for a while now. you make it sounds so easy! I can’t tell you how much fun I have reading your page. I may even give this pattern a try. Pingback: Bee Bento Box Block | Ants to Sugar – Fabric. Quilting. Some modern. Some traditional. Pingback: Ever worry your quilt is going to give someone a migraine? Pingback: frantic - i need the "new" bento box quilt pattern can anyone help?